Every month I post about things I’m loving… sometimes it is real life stuff, style, decor, fellow blogs and so on. So here is a grab-bag of things I’m loving lately. 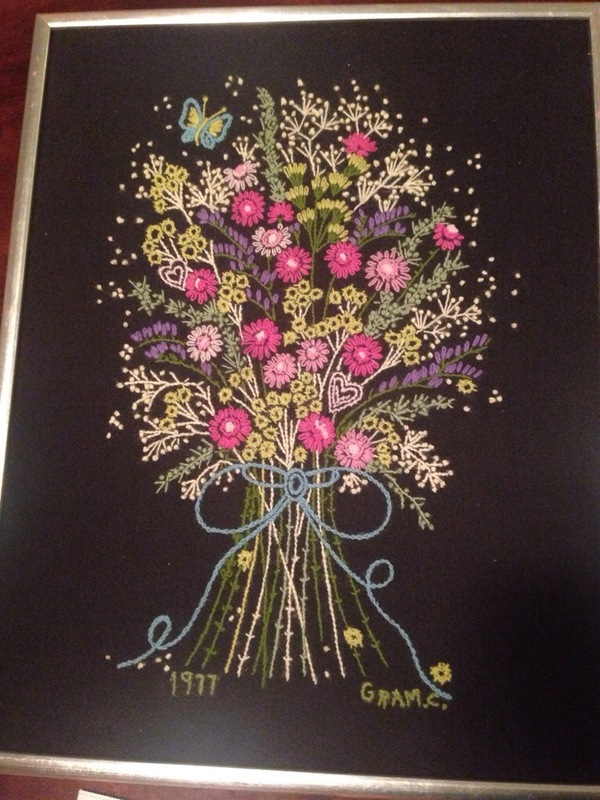 My amazing “Aunt Kathy” of York’s Corks (actually my dad’s cousin but we are close so she earns the “Aunt” title) was going through a box of family stuff and sent me this incredibly detailed frame embroidery by my Great Grandmother “Gram Corc.” I love it for its obvious sentimental value and history. Not to mention the craftsmanship and time this must have taken! I’m not yet sure where to hang it… It could be a cool piece to add to the gallery wall in our foyer espcially with that black background! Or perhaps it could add an interesting pop elsewhere (half bath? or guest room?). Decisions, decisions! 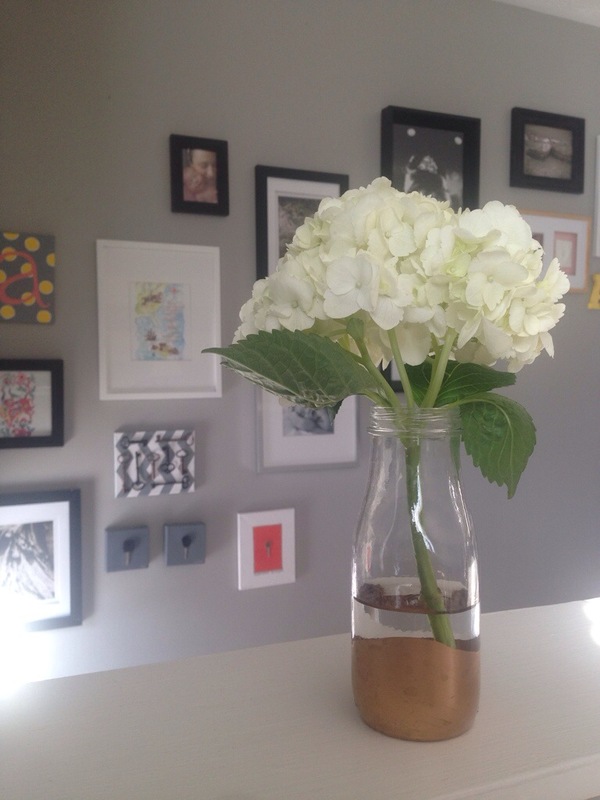 Speaking of the foyer gallery wall… it happens to be the background against my next “love”… fresh hydrangeas! I promise I didn’t do that on purpose. Anyway, when we go grocery shopping everyone gets a “spurge”… sometimes it is something unhealthy (poptarts!) or indulgent (wine for me) or just a total perk like flowers. In the midst of our gloomy, frigid winter I have been so excited to “splurge” on flowers. Then I break them into several small vases and scatter them throughout the house, literally bringing life into each room! Oh yes, dessert. Hubby and I went on our Valentine’s date during a blizzard. That’s how good our favorite place is. Everything on the menu is fantastic so saving room for dessert is difficult. But we look forward to dessert as much as we do the rest of the meal so on our way in, we pass the dessert bar and choose two pieces to be held for us… you know, in case everyone else knows how amazing the homemade confections are. 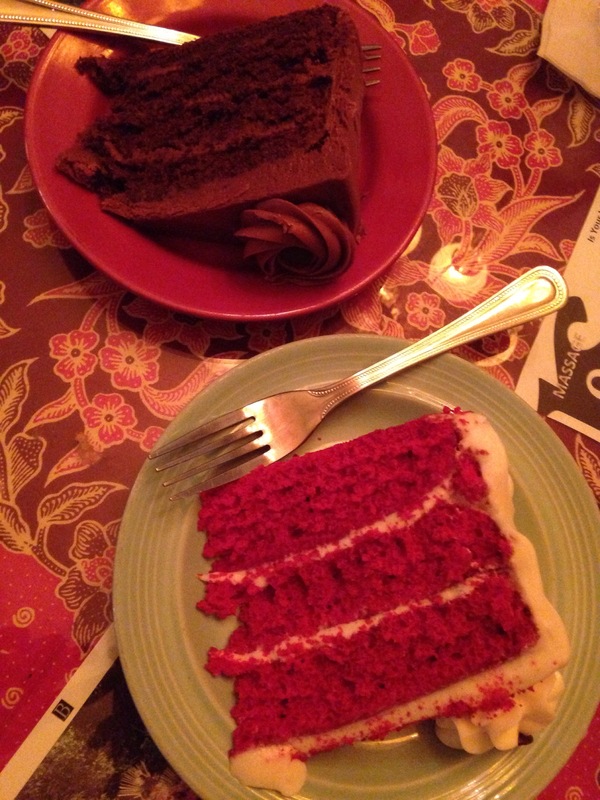 Here we have an Old Fashioned Chocolate Cake and a Classic Red Velvet cake. Both were divine… I may or may not have reenacted the famous cafe scene from When Harry Met Sally. On a separate outing, we went bowling for a friend’s surprise 30th birthday party. I feel like just yesterday we were still celebrating 21st birthdays. So, we’re not so young anymore I guess. What a fun time! Hubby and I realized 4 things: 1- We had never been bowling together before. 2- Hubby is a really good bowler. 3- I am an embarrassingly bad bowler. 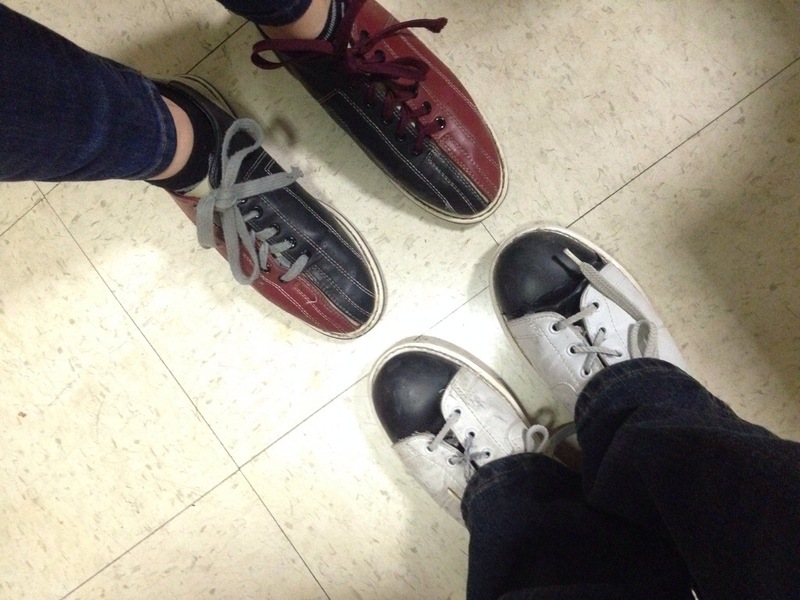 4- The style of bowling shoes haven’t changed in 50+ years. O got new play shoes. 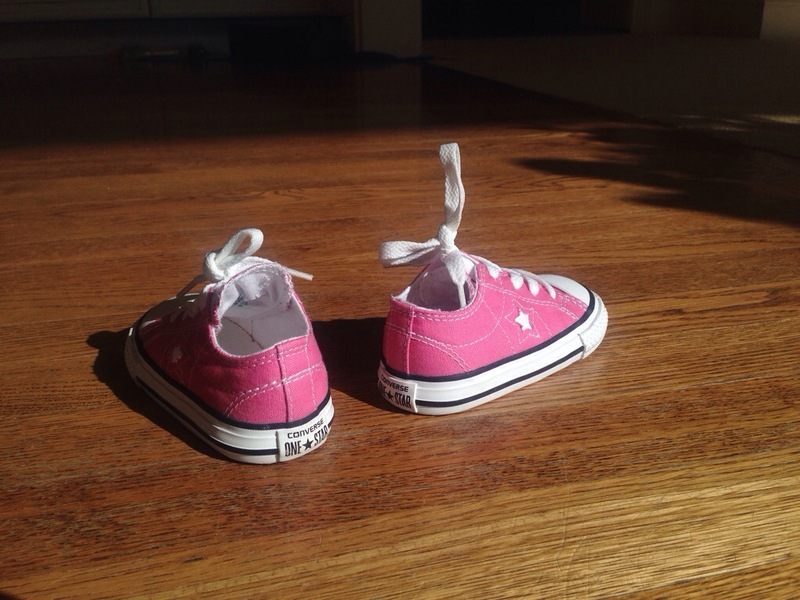 Not just any play shoes: Converse Chuck Taylor sneakers. I grabbed them at Target for less that $20! The good news: she loves them. The bad news: she loves them too much. When I first turned the corner into the shoe section she gasped “SHOOOOOOES!” And I gleamed with pride that my girl loves shoes. And then I realized this might be a really bad (expensive) habit if we don’t keep it in check. Haha! Anyway, she wouldn’t let me take off her other shoes. I had to pry her other shoes off while she screamed “No! My Toms! Mommy! MY. 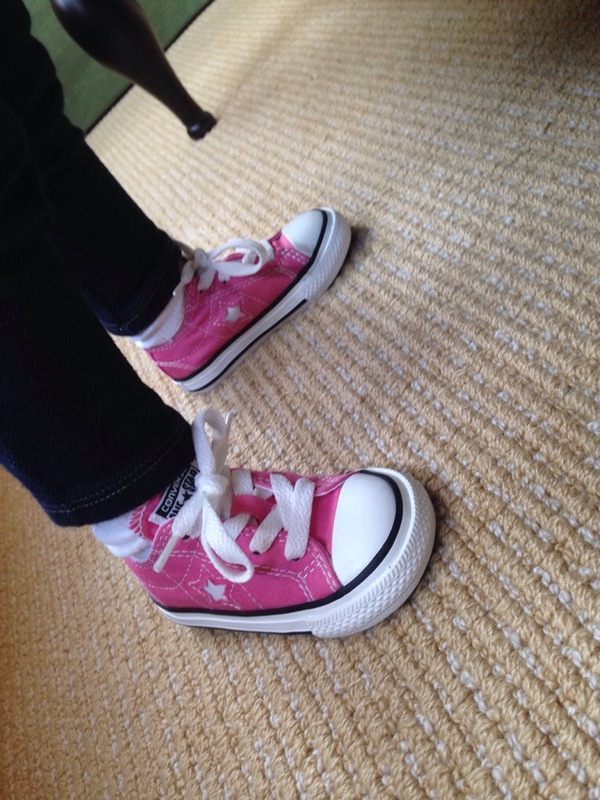 TOMS.” I had to explain that she would get to keep her shoes and buy new ones. She’s been wearing her Chucks since. Like every minute. She even wants to sleep in them (um, no.) 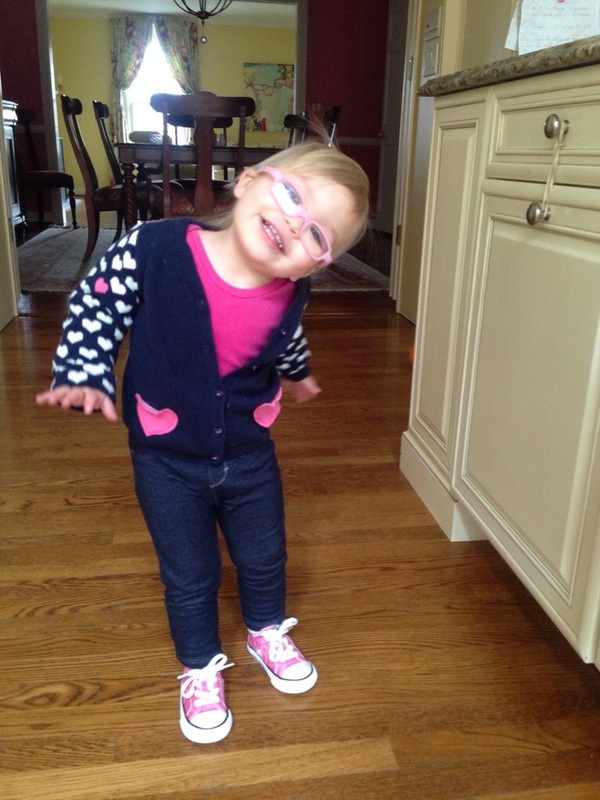 and calls them her “Chuckies.” Oy, I’ve created a monster. We had a freak spurt of nice Spring weather. 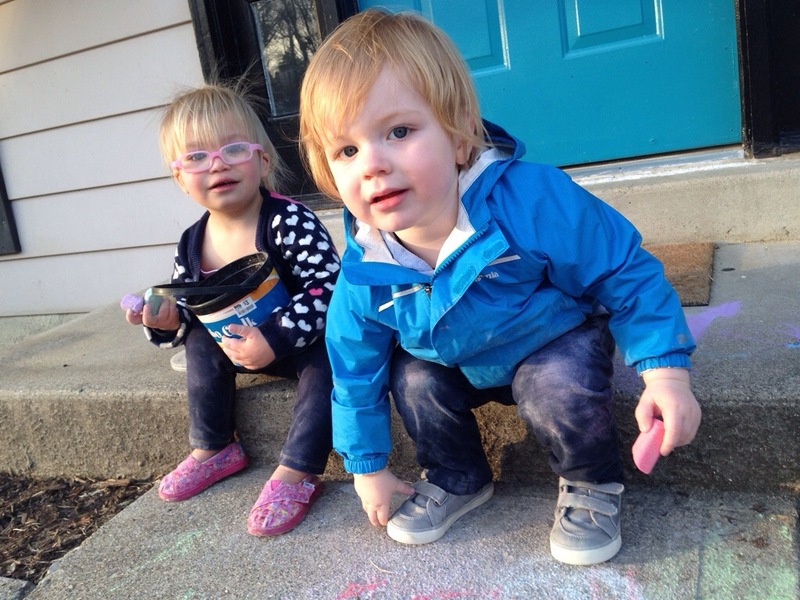 O and her friend H graffiti-ed our entire porch and sidewalk with their chalk art. We had tons of fun and lots of laughs. Too bad their masterpieces are now covered in snow and ice. What a tease… We are all looking forward to more sun and warmth. 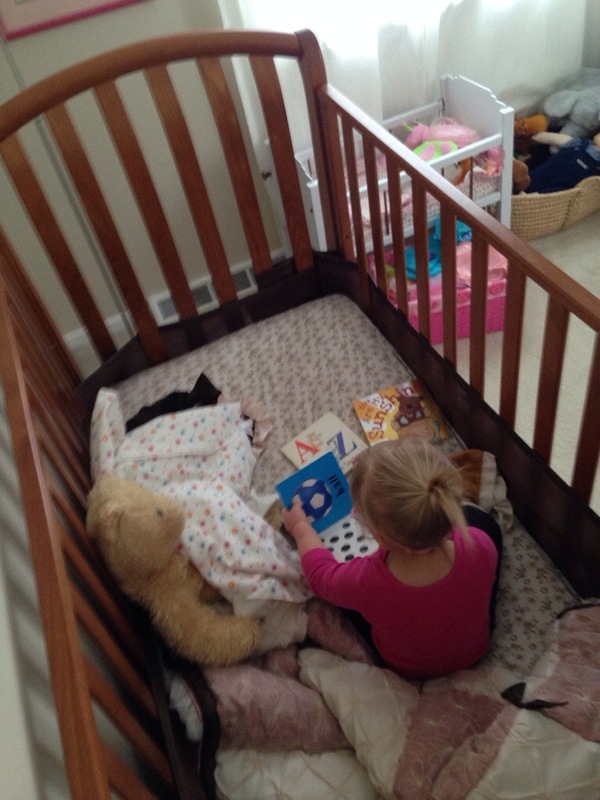 O asked me to tuck her bear in and give her some books. Then I sat in the hall and listened to her read to him and sing “Happy Birthday.” Just too much cuteness. 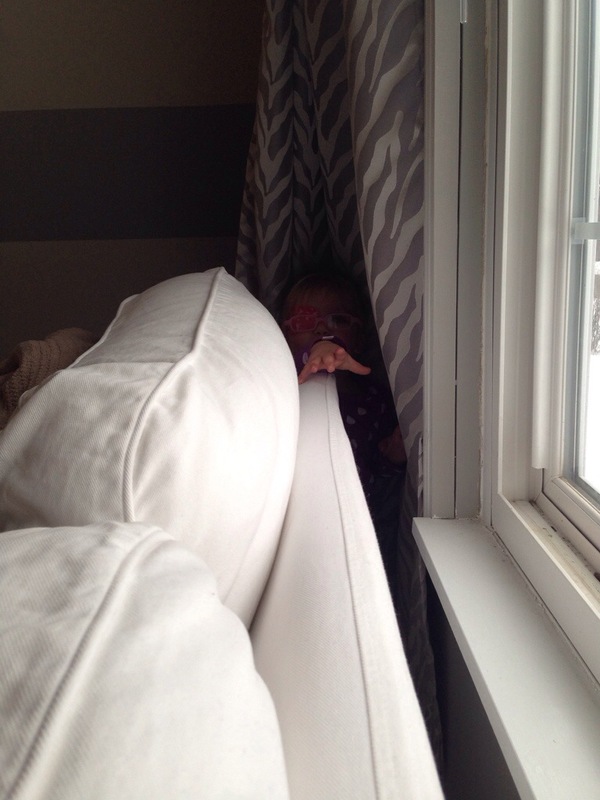 And I can’t forget O’s new favorite hiding spot: behind the couch and the curtain. Winter seems eternal this year. But I’ve been eyeing tons of pink fashion, home decor and jewelry to brighten my days and pull me through these gray winter days. Pink pinterest boards gives me hope. Visit my Pinterest board inspired completely by my love for my daily grind. Brunch with KT of Nerdy Girl Writes. I’ve had the pleasure of an actual real life brunch date with this nerdy girl, but for those of you who aren’t so lucky her “Sunday Brunch” posts will have to suffice. Poke around! She has tons of post on decor, fashion and suggestions for good reads. Nutella Brownies on Cup Of Jo. This woman speaks my language in so many ways. Nutella is my favorite!